Should I Punish Students for Bad Behavior in Another Class? My school has in-school suspension for students that behave inappropriately. I am not sure if it is because of not doing homework or because of what they have said or done. As the "computer" teacher I have never given any work for those students to complete, not much of a punishment if I let them use a computer in my opinion. Today a teacher asked me if I ever sent any work for the student to do. When I replied I didn't she implied the student was "getting off" from doing the work in my class. My reply was that it would be hard for them to do the work in ISS when we are using the computers. I could figure out some make-work for them to do, but our administration is just as capable of that as me. Thinking back over the exchange I have a different response. I really don't think I should punish a student by giving him/her make-work for improper behavior in someone else's class. What do you think? In my media history class I have been having my students create journal entries detailing events that happen during the American Revolution. Here is a link to our blog where you can find the posts. 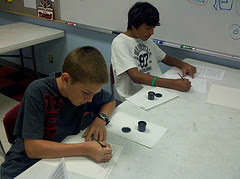 A few years ago I received a calligraphy kit to use for teaching an after school class. It has a class set of pens and points that we used to create handwritten journals entries. While the students enjoyed the activity (I may let them continue to do them that way if they choose), they did have a problem with the pens. They are extremely messy and since my students are not used to working with this new medium, there were a lot of spills. I think that having the students use the old-fashioned tools helps them to understand a little more about the complexity of the process of writing that the soldiers would have had. Imagine having to carry around all that material just to write a journal entry! This week my students will be using the Marvel Create Your Comic web application to illustrate this month's character education word peace. Originally I thought I would have the students use the application to create a fractured fairy tale. That entails re-telling a fairy tale from the point of view of one of the characters. I start that lesson by reading The True Story of the Three Little Pigs an amazing story by Jon Scieszka. Unfortunately, the application does not allow the comics to be saved. The students would have to create a couple pages in class then download them. I think this would really alter the flow of the story (even if they had already written it out.) That is when I decided to go with the character ed. word. On Saturday, November 6 my wife and I will be attending EdcampKC at the University of Central Missouri. EdcampKC is an unconference where the attendees are also the presenters. Many districts, including mine have focused all or a very large percentage of professional development money toward communication arts and mathematics. Unless the conference can be tied directly to either or both of those areas, there is no monetary support from the district. Obviously, this means that I must pay my own way to any conference I wish to attend that deals with technology, even unfortunately technology that can be tied into those areas. Thanks to the sponsors, this conference is free. All it will cost my wife and I is a hotel room, gas, and some money for food. When you consider how expensive other conferences such as METC or ISTE are, you can see how inexpensive this conference really is. Speaking of METC and ISTE, are you aware that presenters are still required to pay to get in to the conferences they are providing the professional development for? While METC gives a discounted rate for presenteres, ISTE requires payment in full! If you choose to present at edcampKC it will cost you nothing. If you choose to just attend edcampKC the price is still zero! I will be presenting this year at METC on the importance of commenting on student blogs. While I have never been to this conference before I gather it is a rather large conference. When I went to the ISTE conference in San Antonio I was overwhelmed by the number of people attending. My point is, I am looking forward to edcampKC because it will be small enough for me to make real connections with others. I went to ISTE to attend, I am going to METC to present, but I am going to edcampKC to meet people. These are people that share my passion for student learning who I will not only learn from them at the conference, but I will be able to continue to learn from them online throughout the year. Ever since I really started to participate on Twitter, my goal was to find passionate educators that care about their students and want to focus on learning. While I have made many contacts and even a few good relationships I cannot wait to develop the types of relationships I have jealously followed others making at unconferences they attended.